The black-throated monitor lizard (also known as the black-throat monitor) is a large lizard with a typically mild temperament when kept as a pet. Black-throated monitors eat whole prey items such as mice, require an extremely large enclosure, and can grow to be over 50 pounds. They are related to the white-throated monitor and the savannah monitor. These big lizards are native to Tanzania. Taxonomists have disagreed on species and subspecies, hence the many name variations. Tanzania has a tropical climate where it stays over 68 degrees year-round (except at the higher elevations). In the wilds of Tanzania, black-throated monitors are carnivores and eat small reptiles, birds, and rodents. Most lizards, such as geckos and chameleons, generally prefer not to be handled by humans. But larger lizards of the monitor family actually need the interaction, and some studies suggest that these lizards are smart enough to recognize their human keepers. If not handled regularly by humans, black-throated monitors in captivity can become aggressive. They'll puff up their bodies and hiss when they're feeling stressed or threatened, and are known to bite as well. Given the animal's size, a bite can do some serious damage. If you see it starting to puff up, back away and leave the animal alone until it shows signs of calming down. Stress is really bad for reptiles, as it can lead to a weakened immune system and a host of health problems. However, if handled frequently and provided with a suitable living environment, black-throated monitors are docile and pleasant pets for most dutiful owners. Their temperaments in the wild might be ornery, but they're relatively gentle in captivity if proper care is provided. A black-throated monitor lizard requires a large and strong enclosure. Most owners end up building a permanent enclosure for their black throats out of wood or plexiglass. The enclosure must be large enough for your monitor to turn around and stretch out. Black-throated monitors can be walked just like dogs (albeit a bit slower) outside in warm weather with a harness and leash. This is great for your monitor in many ways: socialization, UVB rays, and exercise are all good for its health. It's especially beneficial if the enclosure your lizard lives in is on the smaller side. Black-throated monitors are not good swimmers but they are semi-arboreal, meaning they live mostly among trees, especially as juveniles. Adults don't climb as much as they do when they are younger, but they are still able to lumber up a branch if they need to. These diurnal lizards also spend a good amount of time burrowing or hiding under rocks. Black-throated monitors are playful creatures who need stimulation, otherwise, they get bored and restless and may lash out as a result. Black-throated monitors eat many rodents and birds in captivity. Mice, rats and other rodents along with young chickens are generally good options for a black-throated lizard's meals. Captive-bred monitors are more likely to eat pre-killed prey while wild-caught monitors may only eat live prey. There's some debate as to whether these lizards need to stalk or hunt before eating, but if they've been raised in captivity it's likely this primal instinct may be suppressed. Insects, such as crickets, mealworms, and cockroaches can be fed to monitors in addition to their regular meals of rodents and birds. Most monitor owners end up buying pre-killed, frozen mice in bulk online and thaw them as needed to feed. If you do feed insects, dust them with a calcium powder first, and make sure the insect is gut-loaded. Feed your monitor a few times a week and adjust the meal schedule if it becomes too thin or overweight. Weigh your monitor monthly so that you can adjust feedings as needed. 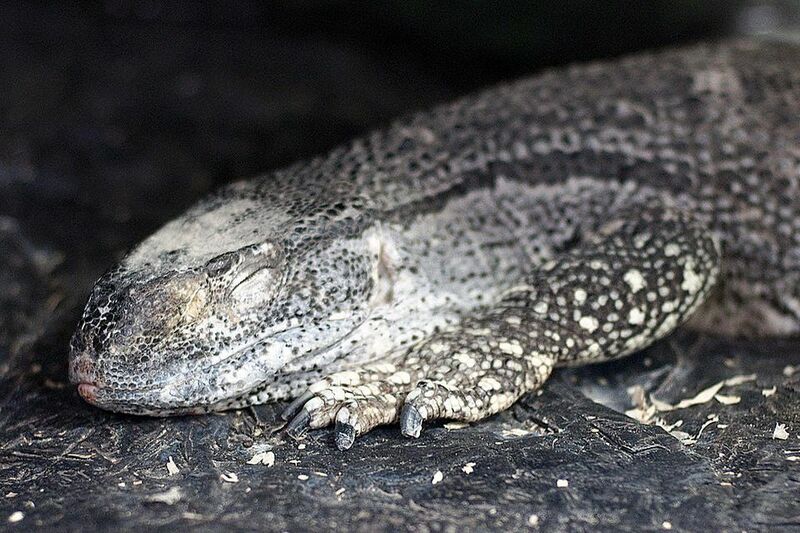 Like other monitors, black throats require UVB rays and heat support. Reptile heat lights and special UVB emitting bulbs can be used to provide your pet with appropriate temperatures and a day/night cycle with the invisible rays that the sun emits. Since these lizards hail from Africa, they like hot temperatures. They should get a basking area that reaches into the upper 90-degree range during the day and stays above 75 degrees at night. If you've decided to house your black-throated monitor outside year round and gets natural sunlight, the artificial UVB lighting is not necessary. Like other monitor lizards and many reptiles, black-throated lizards are susceptible to metabolic bone disease, the result of a calcium-phosphorous imbalance, which usually occurs when the lizard isn't getting enough UVB lighting. Although they are known to contract parasitic infections, black-throated lizards don't get them as often as smaller lizard breeds. A significant health concern to watch out for with any large lizard is constipation due to impaction. Like other big lizards, black-throated monitors have voracious appetites, and often that means they eat things they can't easily digest, like sand or substrate in their cages. If your black-throated lizard seems lethargic or otherwise unwell, don't try to treat its symptoms yourself. Seek treatment from a veterinarian who specializes in lizards. These are large, strong reptiles that can be challenging pets. Be sure you have the resources available to house and food such a big animal. It's also important to check local laws regarding exotic pets where you live. And you'll also want to research whether there is a veterinarian near you who has expertise in reptiles (and specifically lizards, ideally). With most exotic pets, you want to obtain yours from a reputable breeder who can tell you its health history. Clear eyes, smooth skin, and a general alertness are all signs of a healthy black-throated monitor lizard. If it appears lethargic or doesn't take food readily when offered, it may be ill. Still trying to decide on the perfect pet? Review our full collection of monitor lizard profiles.